The third chapter of Holy Roar is dedicated to the BH verb /zamar/. However, the authors have actually printed /ramaz/ in BH, which is not a word in BH (However it is, with metathesis for /razam/, a word in Mandean which means “to wink with the eyes”). This chapter is not as bad as the other chapters in terms of method. Whereas with /yadah/ and /hillel/ the authors incorrectly collapsed all meanings in different stems on to the root word, they have not done so here. 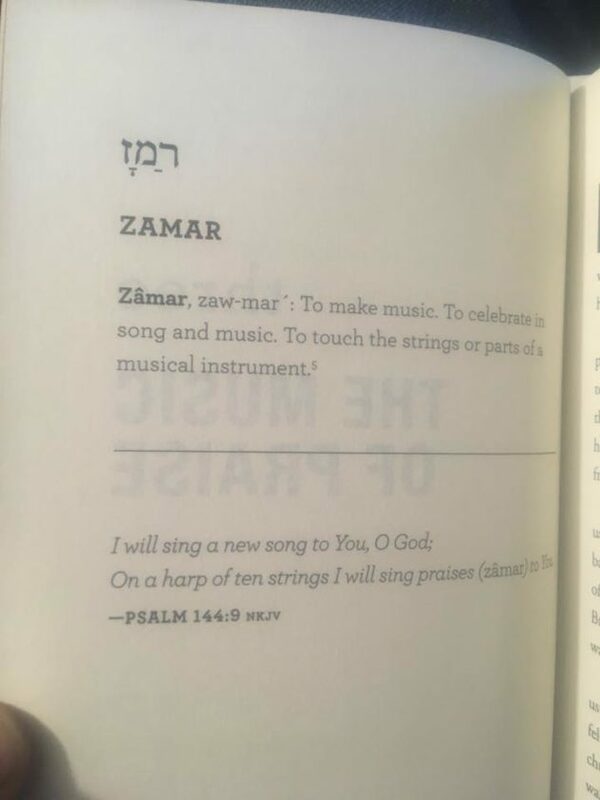 /Zamar/ in the Piel stem in BH indeed means “to sing praise” and is most often used in the Psalter. However, it is also used in the Qal and Nifal stems meaning “to prune” or “be pruned”, respectively. There is also a usage in BH that derives from Arabic that in verb form refers to (a gazelle) jumping and in the noun form to the animal (gazelle) itself. It is commendable that the authors did not collapse unrelated meanings on top of the root and then teach something silly like /zamar/ means to sing praise to God while jumping like a gazelle. I’m glad they knew to not do that. But then I wonder, why did they not know to do that with /yadah/ and /hillel/? Whitehead states that /zamar/ is used 41 times in the Hebrew Bible, including both in the Psalms and in narrative. This is incorrect. A simple search on any reliable Bible software (like Accordance, BibleWorks, or Logos) shows that /zamar/ occurs 54 times over 50 verses in the Hebrew Bible. The authors show in their Notes that they use Logos Bible Software. However, the only resource they cite is Strong’s Concordance. We are only left to conclude that instead of investigating the usage of /zamar/ for himself, Whitehead simply copied and pasted what he found in Strong’s. This is not a reliable method and it is misleading of him to claim that he “read” things in “Hebrew” (p34), when his claims clearly don’t line up with Hebrew (not even in the way they printed Hebrew words). Chapter 3 gives a handful of examples of the verb /zamar/ being used to symbolize music-making. The authors rightly note that music can be a powerful tool for many purposes: to set a mood (2 Kgs 3:15-16; note: /zamar/ is not in this verse, just the idea of music as important), to relieve stress (Psa 57:7), and to bring people together in worship (Psa 7:17). The only mistake made here is the reversion back to incorrect data on /yadah/ as it is used in Psa 7:17. Psa 7 says nothing about posture or what one should do with their hands. Lifting the hands and /zamar/ are not related in the text as the authors suggest here. I was surprised that the authors did not take this chance to talk about the most frequnelty used word in BH that is built from the root /zmr/. That word is /mizmor/. Can you see the “z”, “m”, and “r” in /mizmor/? That is the root /zmr/ (with vowels, pronounced /zamar/). /Mizmor/ is the technical term in the Bible for a psalm. When we read in the superscriptions “A psalm of David” (as in Psa 3 for example), that word for “psalm” is /mizmor/ in BH. This is vitally important for understanding the role of Psalms throughout history. In fact, the primary way that people have learned their theology has been through singing. People often treat the Psalms as simply the worship songs for ancient Israel. As if the important stuff where elsewhere and Psalms is just the songbook. The evidence from history says something different. In the Dead Sea Scrolls, there are approximately double the amount of copies of Psalms than the next most copied book of the Bible (Genesis). There are 20-21 copies of Genesis in the Dead Sea Scrolls while there are 36 of Psalms (according to Tov’s book p96-97. Note, some online resources cite 41 scrolls for Psalms) . The evidence shows that people used Psalms more often. Most of the time when ancient people engaged with the Bible, it was with a /mizmor/. This should not be taken by us as a lesson on how we should posture ourselves physically when we sing together. Rather, it should be taken as a lesson by us on how artful and powerful the songs we sing should be. We should have high standards for our songs. When we sing together, we must recognize that we are teaching people what we believe. This is will be the primary way that many people learn. Since it is so important, we should take our songs seriously and encourage our artists to be bold in their music. Song writers can be the world’s most impactful teachers. So make worthy psalms.